Discovery is an abandoned German research facility located in Antartica. Similiar to the facility from the campaign mission Project Nova. 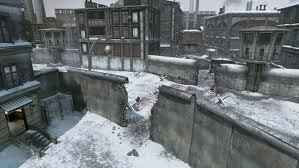 It is a medium sized map that features long sight lines for for snipers, and a destructable ice bridge in the middle. A very fun match for for Team Deathmatch and Search and Destroy. There is an ice bridge on the map that is destructable. It can be destroyed by any explosive. Once the bridge is destroyed, you can no longer cross it. Located at Checkpoint Charlie in Germany, Berlin Wall features long corridors and tall buildings that are great for snipers. It also features a "no mans land" are where automatic turrets will hunt you down. 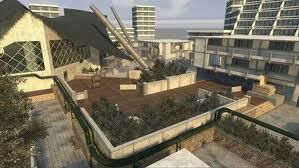 Although it can be boring and slow paced in Team Deathmatch, it can be a tun of fun in Search and Destroy. Berlin Wall is another great place for long range snipers, but also people who like to use shotguns. Kowloon is an urban rooftop located in Kowloon City, China. The environment is very similiar to the campaign mission numbers. 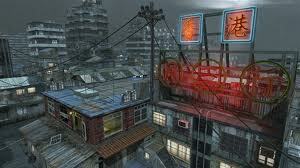 Kowloon features a zip-line that allows the player to travel from one location to another very quickly. While using the zip-line, the player is unable to to use their weapon and they can be picked off easily. It's almost a 1-10 chance that your going to make it across the zip-line alive. Sub-machine guns and assault rifles are reccomended for this map. Stadium is a hockey arena located in the North-Eastern United States. It is a small map that will be great for close encounters. Shotgunning or sub-machine guns are very effective in this map as well. 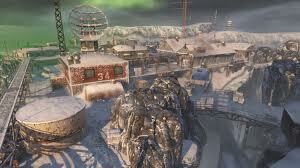 Although this map isnt as small as Nuketown, this map is very fast-paced. This Map Pack will be available for Wii and PlayStation 3 on March 1st, 2011.